Here at WOW we want to hear from you! We're really interested in hearing about what experiences you have had in the workplace, both postive and challenging. Please use the form below to share your story, and don't forget to look out for Member stories as they come in! This is the series of Message from a member. 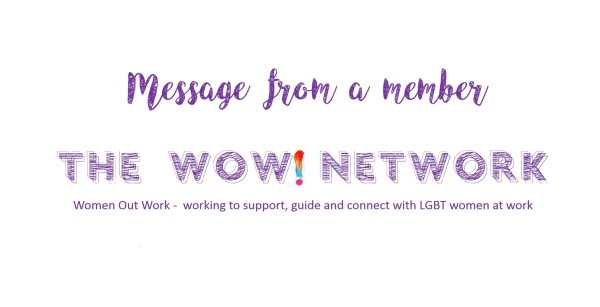 This is your chance to tell us about an experience of yours which relates to The WOW Network, whether it be coming out at work, attending a Pride or giving advice to other members. 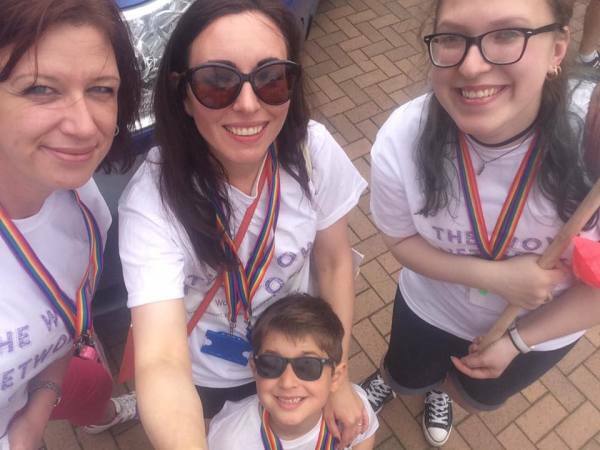 The first Message from a Member is from Angela Trickett, who attended her first Pride in May 2017, as a straight ally and supporter of The WOW Network's work. One wet and grey Wednesday I got on a train to Birmingham. I have one of those pesky "invisible disabilities". Nobody on the crammed train could tell I was in agony standing for those 20 minutes, nobody offered me a seat and having had more conversations than I can count over trying to "prove" I really needed to sit down I just grinned (grimaced) and bore it in a resigned feeling that it just wasn't worth the fight. I was on my way to a Health and Safety briefing ahead of Birmingham Pride. I arrived in agony, sweaty and miserable. As I walked into the room that dispersed. The atmosphere of acceptance, support, love and kindness was almost tangible. At this point I feel it's necessary to say I'm straight. It's not really anybody's business who I'm attracted to, who I choose to spend my life with or sleep with any more than anybody who "belonged" at that meeting should reveal those choices but it's relevant to the point I'm making. As I sat, smiled, chatted and listened the voices in my mind were screaming "YOU'RE DIFFERENT", "YOU DON'T BELONG", THEY ALL KNOW YOU'RE NOT LIKE THEM". Ultimately it didn't matter. I wasn't there to dance around and tell everyone that I'm comfortable in the gender I was born in and my sexual attraction fits the historic social norms. I was there to represent a cause I believe in and be prepared to attend a celebration of that cause safely. In fact it was a great eye-opener for me. Those voices are probably what people who are different to me hear in their minds ALL THE TIME. It's perfectly plausible that a gay CEO whether she is out or not has that feeling of a neon sign above her head flashing "DIFFERENT! THEY ALL KNOW!" every time she addresses her employees. I can see a little of the struggle faced now. It's not just the prejudiced attitudes and behaviours of others; it's a struggle with your own mind. I'll never fully understand, I don't believe any of us can ever truly walk in another person's shoes but we can open our minds to offer compassion to others. To (mis)quote and paraphrase the founder of the WOW Network, Lisa Charlwood-Green "an ally is just as important as the LGBT person in front of you, they CHOOSE to join the fight when they could blithely walk on by". So I choose to act. I choose to challenge the words of others when I'm unhappy with the way they speak or behave. I choose to support ALL people in our common goal regardless of our personal differences. I choose acceptance, support and kindness; just as I was given in that room on a wet, grey Wednesday evening.